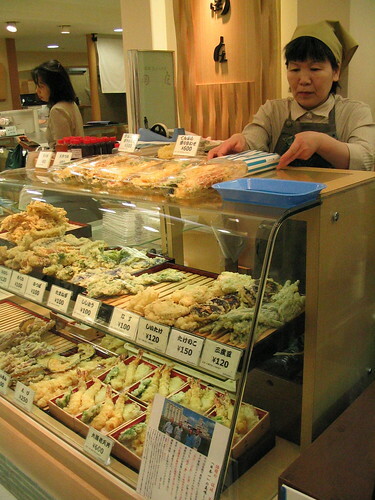 In lieu of posting about my current food adventures, I’m continuing this flashback to 2004 and my trip to Japan. That year was the start of the digital camera age. For me at least. I began the annoying habit of snapping photos up of everything and everywhere: the neighbor’s dog, plants and lots of food. The food on the airplane consumed on the way to Tokyo was no exception. I’m not one of those people who doesn’t like airplane food. In fact, I’m okay with it. 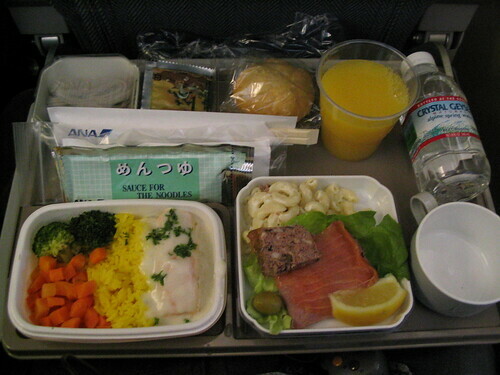 I remember quite fondly some good meals I had in the air. The food onboard Al Nippon was edible but unmemorable. Frankly, it was so long ago, I can’t go into detail of each bite, only that I ate everything and a warm towelette preceded each meal. My Japanese is extremely limited (soo desu ne) and reading comprehension is nonexistent. 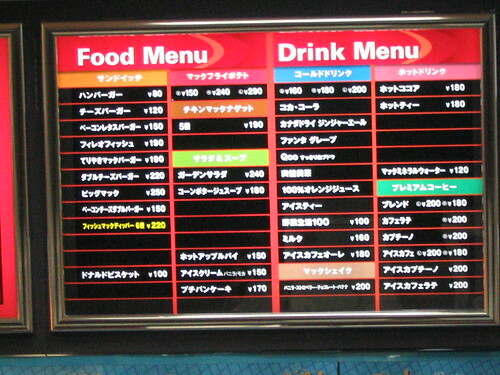 In fact, I was baffled when viewing the menu to a McDonald’s on the way back to our hotel room. But I was equally delighted at seeing an elderly woman eating McDonald’s pancakes with chopsticks the next morning on the way to do some sightseeing. Tokyo wasn’t the only city visited in Japan. We also took a bullet train to Kyoto. 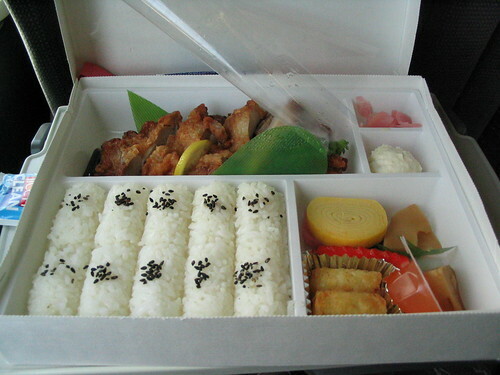 On board, we bought and consumed an extravagently packaged bento box of chicken karage. I loved the cute cylinders of rice. 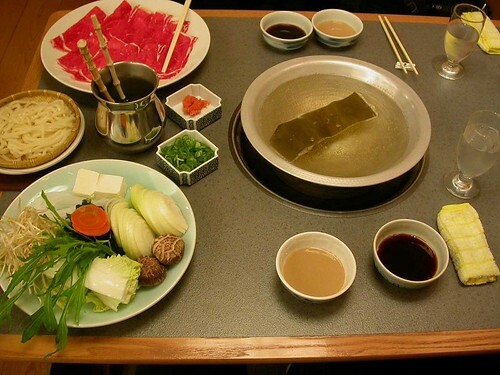 By far, the most expensive meal was the shabu shabu in Kyoto, at 6,000 yen ($58 US in 2004) for two people. Prior to the trip, I had never experienced shabu shabu, the cooking of thinly sliced raw meat in broth. I’d heard about it was one of many things I wanted to try while in Japan. Unfortunately, no one in the restaurant spoke a lick of English but it was one of the best “first” meal experiences I have ever had. Everything was all-you-could-eat and well worth the cost. And of course, the trip to Japan would not have been complete without a trip to a sushi bar. Prior to Japan, I didn’t venture too much into sushi territory, with the exception of the occasional California roll. But since then, I have grown to appreciate — and long for — sake (salmon). The sushi bar was located, along with other small stores, under rail tracks. It was the only food establishment visited twice with the exception of a nearby AM/PM near our ryokan to stock up on iced coffee. Thankfully, the visit wasn’t a whirlwind compared to the 2002 trip to Europe. The seven-day trip left us with still so much to see and do. We definitely plan to return in a few years and eat our way around the country again. More photos from the trip can be viewed here. i SO want to go there!D, thanks for sharing this. i'm totally wanting to get out there someday…Have you tried the sushi at SIPZ? :)i didn't get a dig camera till last year; my mom, bless her heart and soul, bought me one for my birthday and i've been lovin' it… i like airplane food, too, btw, but then it's been such a long time since i had any. Wish i had time and money to travel more! !Domo arigato (Mr. Roboto)… i need to bone up on my Japanese before i go… one of these daze! Hi Kleopatra–Japan was wonderful: the people are so nice regardless whether you speak the language or not. It's a must-visit place. Japan is soooo high on our list of places to visit. My hubby speaks some Japanese, he's been before and knows that I would love it. Your pics look amazing! Hi Nanette–Oh, you MUST go to Japan. It wasn't very expensive at all and so much fun. I was there several years ago, and a little apprehensive about food before the trip. Turned out to be my biggest and most enjoyable surprise, to this day I don't think I've eaten better. And oddly there was an Italian-fusion thing going on at the time, several sit downs to the best Italian I've ever had. We really want to go to Japan, but are a bit terrified that we'll have no idea what we're ordering anywhere! or eating for that matter. Worrisome for the husband who is vegetarian. 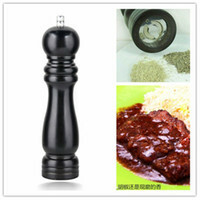 Hi SuperEdco–Glad to hear the trip turned out well food-wise. It's always an experience and breaks down the barrier when you can experience food on a cultural-level.Hi Amy Purple–I think you would love Japan and I believe there are food options that would be agreeable to you and your husband. Nice blog! I really like seeing all of the meals from your travels. I'm looking forward to doing more of that myself. Hi Psychgrad–Thanks! Good luck on your travels!! I think Japan is one of my favorite places to visit – everyone is so polite and helpful, transportation seems so efficient, and there is food everywhere. When I go with my mom, we always go to this one tonkatsu place (I will have to look up what and where it actually is) that she only knows how to get to from the train station and visual landmarks. People line up before it opens because there are only 20 spots at the bar. You either order tonkatsu or a double order, hot tea, rice and cabbage are unlimited. I don’t know if it’s truly the best, but it’s really good and I suppose the crowds can’t be wrong. I’m glad you feel the same way. I really need to make a return visit and for some reason the one time we went, we also lost a load of weight despite all the great food we ate.